A plant native to Europe and Asia that is grown for its fiber or its seeds. Similar to several other plants that are not actually considered grains (amaranth and buckwheat, for example), Flax is often used like one. In ancient times, the seeds were ground into flour or meal, but today this is less common. The small seeds which are classified as either brown or golden (yellow) Flaxseed, most often are used as a substitute for butter or as food additives because of the delicious nutty flavor and the nutritional benefits they provide. Flaxseeds are one of the best sources of omega-3 fatty acids, which are beneficial in reducing cholesterol and lowering the risk of stroke and heart disease. Flaxseeds are also considered to be beneficial at preventing some forms of cancer, Colitis, and Crohn's Disease due to the amount of fiber and antioxidant known as lignan, a type of phytoestrogen, that it provides. 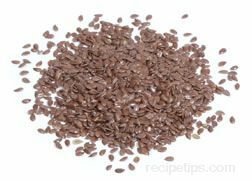 In addition, other benefits of using Flaxseed as a food item include the lowering of blood pressure, and LDL (bad cholesterol). Flaxseeds are often used as an added ingredient when making yeast breads or they are sprinkled on cereal and salads. Flaxseed is found in health food stores and in well-stocked supermarkets. Flaxseed is often used as a butter substitute or as an oil substitue. Ground seeds can be purchased in food stores as a nutty flavored spread or can be ground by the consumer into a creamy consistency and added to foods. Flaxseeds can also be used as an egg substitute when making muffins or pancakes. 1 tablespoon of ground flax seed plus water equals one egg. The difference from using a real egg is the consistency of the mixed ingredients - a gummier texture and less volume. In the United States, most of the Flax is used to produce linen cloth, paper, twine, and linseed oil, which is an inedible version of Flaxseed oil and is used specifically for paints and varnishes. Flaxseed is also referred to as linseed.